US Economy Turns On The Afterburners - Is A Rate Hike Next? U.S. Economy Turns On The Afterburners – Is A Rate Hike Next? Quick, think back nine years ago to June 2006. Can you recall what was happening then? Let me give you some hints. Shakira’s “Hips Don’t Lie” was blasting from radios, and moviegoers were lining up to see The Da Vinci Code. The U.S. was deeply involved in Iraq, where Saddam Hussein was being held and awaiting trial. And with Windows Vista still in beta testing, Bill Gates announced he would step down as chairman of Microsoft. That June also marked the last time the Federal Reserve hiked interest rates. So when will they be raised again? Next Wednesday the world will tune in to see if Fed Chair Janet Yellen can answer that question. Though it’s anyone’s guess what she’ll say, there’s no denying that many of the economic indicators the Fed is keeping an eye on have sharply improved lately. This has huge implications for investors, a topic I touched on during my recent keynote address at the Canadian Investment Conference in Vancouver. You can watch a brief segment below. The U.S. jobs market in May was strong on several fronts, indicating that the economy has indeed turned a new corner. Businesses added 280,000 jobs, beating estimates by more than 50,000, while jobless claims stayed below 300,000 for the fourteenth straight month. Hourly wages rose 0.3 percent in May, 2.3 percent for the year. This is pulling people back into the labor force and has helped stabilize the still-low participation rate. Among those finding work are young people, whose employment rate has risen over 10 percent in the last five years to add three million new workers. Investment banking and research firm Evercore ISI estimates that this trend will be sustained for the rest of the decade. All of this is good news for individuals and businesses alike. I said in a recent Frank Talk that businesses should see job creation and wage increases as opportunities to build a new demographic of consumers and investors. We’re seeing this unfold, as consumer spending is way up. Retail sales climbed 1.2 percent in May, while car and light truck sales grew 8 percent, leaving estimates in the dust. So far, 2015 is turning out to be a stellar year for automakers such as Ford, held in our All American Equity Fund (GBTFX), as they aspire to reach the psychologically important 17 million units sold. To meet supercharged auto demand, Ford plans to reduce the number of days its assembly plants are shut down this summer, from two weeks to one week. Airlines are also positioned to benefit handsomely from an improved U.S. economy. This week, the International Air Transport Association (IATA) announced that it expects the industry’s net income to ascend to a record $29.3 billion this year, an increase of 80 percent from 2014. The group also projects that return on capital will exceed borrowing costs, an industry first. Airlines are so optimistic of sustained economic momentum that a staggering $5.6 trillion in new aircraft orders are expected to be placed over the course of the next 20 years. That’s according to Boeing, which we hold in our Holmes Macro Trends Fund (MEGAX). In its latest outlook report, the aircraft manufacturer says that commercial jet fleets will more than double over this period, from 21,600 units to 43,560 units. Close to 60 percent of these new aircraft will be to accommodate growth in global air travel demand. 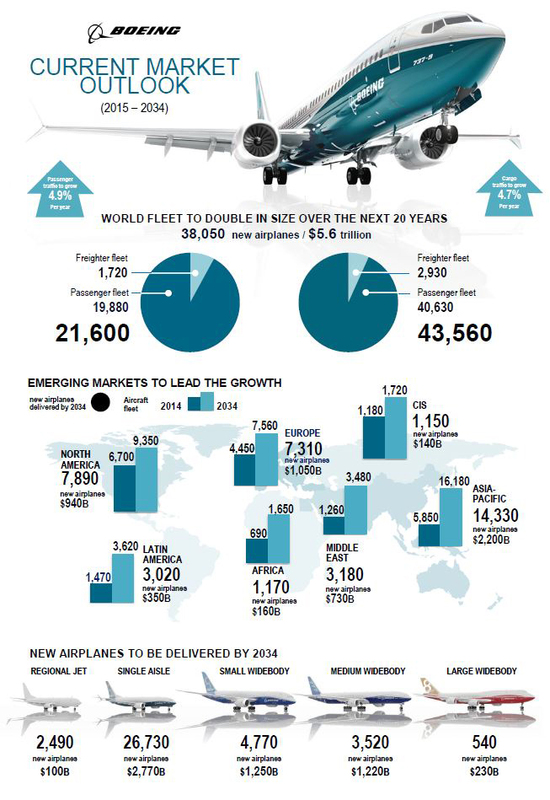 Check out this infographic of Boeing’s current market outlook, courtesy of World Property Journal. In the past 16 months, businesses have authorized over 1,000 deals—including mergers and acquisitions (M&A), initial public offerings and stock buybacks—for a total of $750 billion as of May. The biggest M&As right now are chemical producer BASF’s $35 billion bid to buy Syngenta’s seed business, and the possible acquisition of T-Mobile by Dish for the same amount. To fund these and other deals, businesses are increasingly turning to banks, which lent out $16 billion last week alone. This year, loan amounts are expected to surpass the previous record, suggesting that banks are gaining faith in borrowers’ ability to make payments. Everything seems to point to a rate hike—if not this year, then within the next 12 months. The idea might worry some investors, but it’s important to keep in mind that rate normalization from current levels indicates that the economy is improving. For municipal bond investors, this means staying with or moving into quality, shorter-term munis—the very kind our Near-Term Tax Free Fund (NEARX)) invests in—as their prices are less susceptible to rate fluctuations than longer-term bonds are. As you can see below in the hypothetical example using a two-year, 10-year and 30-year Treasury, the further out the maturity date and higher the rate hike, the more your security would be affected. Again, these are Treasuries, not municipal bonds, but munis could be similarly affected. One last thing to be aware of: After a stellar performance in 2014, munis have traded sideways lately as investors await news from the Fed. The challenging nature of the bond market right now should not change your overall diversification strategy if it has always included fixed income. And when rates do rise—whenever that might be—our team will be able to reinvest our maturing bonds in bonds that pay higher yields. The major market indices finished mixed this week. The Dow Jones Industrial Average gained 0.28 percent. The S&P 500 gained 0.06 percent, while the Nasdaq Composite fell 0.34 percent. The Russell 2000 small capitalization index gained 0.32 percent this week. The Hang Seng Composite fell 0.69 percent this week; while Taiwan fell 0.41 percent and the KOSPI fell 0.77 percent. The 10-year Treasury bond yield was basically flat for the week at 2.39 percent. The financials sector was the best performer in the S&P 500 this week as the 10-year yield on U.S. Treasuries continued showing strength. The S&P 500 Financials Index closed up 1.00 percent this week. German industrial production grew by 0.9 percent for the month of April, outperforming analysts’ expectations of 0.6 percent. Investors are closely watching economic data activity to see what effects the European Central Bank’s (ECB’s) bond purchasing program will have. U.S. retail sales, excluding automobiles and gasoline, expanded by 0.7 percent for the month of May, outperforming expectations of a 0.5 percent expansion. This data release should positively impact consumer-oriented stocks. Energy was the worst performing sector in the S&P 500 this week as oil prices continue to lack any momentum. The S&P 500 Energy Index fell 0.93 percent this week. Inflation expectations, as measured by the breakeven inflation rate on five-year U.S. inflation-protected bonds, have remained static for a few weeks now. This is a negative sign that investors are not confident that global relations are taking place. The U.S. dollar fell for the second week in a row and appears more and more like it is in a downtrend. This is negative for the U.S. consumer and any related companies. The NFIB Small Business Optimism Index rose to 98.3 for the month of May, surpassing analysts’ forecast. This is very positive for U.S. growth, especially with the Federal Reserve looking to raise interest rates in September. Consumer confidence remains considerably strong, as the University of Michigan Consumer Sentiment Index jumped to 94.6 from 90.7 the prior month. Consumer-oriented stocks could receive further tailwinds from the expected increase in spending. Industrial production growth for the month of May will be released next week. This indicator is expected to increase from the prior month’s disappointing reading. Germany’s two important economic surveys, the ZEW Germany Assessment of Current Situation and the ZEW Germany Expectation of Economic Growth, will be released next week as well, and are expected to yield negative results. Germany’s consumer price index (CPI) inflation data for the prior month will be released next week and is expected to remain unchanged, according to analysts. Certain yield-sensitive areas such as utilities and MLPs remain under considerable pressure given the recent breakout in the U.S. government 10-year yield. Greece’s financial future is looking more precarious after another week of debt negotiations yielded no tangible results. Global stocks surged and bonds sold off sharply as hopes for a Greek agreement rose before retracing that movement when the stalemate continued. The 10-year U.S. Treasury yield ended the week at 2.38 percent and the 10-year German bund yield fell to 0.83 percent after hitting resistance midweek at 2.5 percent and 1.0 percent, respectively. WTI crude oil ended the week just shy of $60 per barrel, with Brent crude just under $64. A big puzzle in the U.S. economy in recent months is weak consumer spending despite strong job growth, a mild pick-up in wages, improved confidence and low gas prices. Hence, the strong May retail sales report was a relief. Headline sales jumped 1.2 percent and prior months were revised higher. The U.S. consumer isn’t dead after all. The Federal Reserve’s Labor Market Conditions Index (LMCI) rose 1.3 points in May, after declining by 0.5 in April. The improvement in the index is consistent with improvements in the employment report, although the LMCI reflects a much broader set of market indicators. Prior months were revised up as well. Wholesale inventories added 0.4 percent in April, above the expected 0.2 percent month-over-month and up from 0.2 percent month-over-month in March (revised up from 0.1 percent initially). The stronger-than-expected data bodes well for second-quarter GDP growth. The volatility in government bond markets is now much greater than in the stock markets for the first time in a very long period. This type of movement is unusual and serves as yet another example of the dangerous distortions being created by the G7 countries and central banks. The volatility has been fueled by the increasing probability of tightening by the Federal Reserve. Additionally, the lack of liquidity in bond markets is a consequence of (1) the G7 central banks buying so many government bonds and (2) the regulatory-driven dramatic reduction in the sell-side’s holdings of debt securities on their own balance sheets. Overseas disinflationary pressure continues to be present as the import price index remains in deep negative territory at -9.6 percent. Although volatility moderated towards the end of the week, both U.S. and German yields remain near multi-month highs. This week saw the largest weekly global bond outflow in 18 months with $5.9 billion in outflows. The Empire State Manufacturing Index is likely to rise to 6.0 in June after two months of relatively disappointing reports. The biggest driver supporting the rise will be aggregate demand, which has shown signs of resurgence following the slowdown at the beginning of the year. May housing starts could dip back to a 1.05 million unit rate (SAAR) as a giveback from the exceptional gain in April. However, this would leave the three-month moving average at the same pace, up from the 993,000 rate in April. Looking forward, housing starts should continue on an upward trajectory as household formation recovers along with improving labor market conditions. The Federal Reserve is unlikely to hike rates at the June Federal Open Market Committee (FOMC) meeting, but September should remain in focus as recent activity data has improved on net. The assessment of the economy should note modest improvement in the data on net since the April meeting, particularly the labor market, which has been key to Fed hiking plans. Conversely, core PCE inflation has softened recently, but the FOMC will likely attribute that to transitory factors. The improved U.S. outlook could be partially offset by an increase in global risks such as Greece. There should be no substantive changes to the policy discussion, however, as the FOMC continues to be data dependent. May’s headline consumer price index (CPI) data, to be released next week, will likely jump to the expected 0.5 percent month-over-month, particularly due to the increase in energy prices. The current account deficit likely swelled in in the first quarter and could end up being higher than the expected -$116.4 billion, owing to the deterioration in goods and services. It looks as though the strong U.S. dollar appreciation has held back exports, especially on the manufactured goods side. With the rise in government bond yields, 30-year fixed mortgages have been pushed to multi-month highs, potentially deterring first-time homeowners. For the week, spot gold closed at $1,181.65 up $9.65 per ounce, or 0.82 percent. Gold stocks, as measured by the NYSE Arca Gold Miners Index, lost 1.59 percent. The U.S. Trade-Weighted Dollar Index slipped 1.39 percent for the week. Gold traders are split over the prospects for gold after prices recovered from an 11-week low reached on June 5. Shanghai Gold Exchange withdrawals reached 1,015.4 million tons as of June 5 and are on track to exceed last year’s withdrawals. The U.S. dollar slid after a French official said President Barack Obama told delegates at the G7 summit on Sunday that the strong dollar posed a problem. The dollar then pared its declines after the White House denied the statement. Omar Esiner, chief market analyst at Commonwealth Foreign Exchange, stated that there is a sense that both monetary- and policy-makers may be starting to become uncomfortable with the dollar’s strength. The gold monetization scheme in India aims to unlock the value of jewelry sitting idle. However, the current plan may not be enough to lure people to park their gold in a scheme that offers one gram for every 100 in a year. Furthermore, it may prove difficult to overcome people’s sentimental attachment to their jewelry assets placed on deposit as they will be melted for only a 1-percent return. Assets in the world’s biggest gold-backed exchange-traded product slumped to the lowest since the start of the financial crisis as equities rallied and investors prepared for the onset of higher U.S. interest rates, hurting demand. Federal fund futures contracts are showing about a 58-percent probability that the Federal Reserve will raise rates by the end of the year. Global coin demand this year will probably slump to the lowest since 2008, according to TD Securities. Some bloggers are using this and the gold ETF liquidations to support their disposition that gold should be avoided at this time. However, as the chart above shows, we are now approaching some of the longest timeframes without a 10 percent correction in the S&P 500 Index. As we outlined last week in our Investor Alert, the Fed is intent on ending its free money policy; Net Free Credit is at an extremely low reading; long rates have spiked, wiping billions out of fixed income market—what else might go wrong? A correction in the stock market is inevitable, as the data shows. Practice safe asset allocation; own some assets that don’t correlate to market returns, such as gold and or gold stocks, so you have a diversified portfolio to manage market volatility. The latest quarterly update of exploration spending from the Australian Bureau of Statistics shows spending on mineral exploration in the country hit a fresh, near-decade low. Deals are starting to happen and we believe that this will set the stage for further consolidation and rationalization in the gold mining sector. Newmont Mining agreed to buy the Cripple Creek & Victor mine in Colorado from AngloGold Ashanti for $820 million. We see the price paid to acquire the asset giving most of the value accretion over to AngloGold. A second consolidation announced this week will likely deliver some real value creation in the future. Five junior companies came together to form one entity that will be worth an estimated $122 million. Collectively they have four projects holding more than six million ounces of high grade gold, along with $65 million in cash. The deal was triggered by a $20 million investment by Osisko Gold Royalties into Oban Mining, which is leading the consolidation. Two of the juniors, struggling to advance existing projects, are to join forces with three that have significant cash piles but little in the way of exploration assets. The projects are located in Quebec and Ontario. John Burzynski, co-founder of Osisko Mining, will be the new CEO and Sean Roosen and Ned Goodman will be co-chairmen. In other news in the junior space, Eastmain Resources announced it has filed an independent National Instrument 43-101 technical report on its Clearwater gold project, which hosts 885,000 ounces of gold at a grade of 4.05 grams per tonne (g/t). For an open pit mining operation, this would be one of the highest-grade projects available in North America of significant merit. In addition, Balmoral Resources reported its final winter drill results at Bug Lake that included intercepts of 4.16 g/t gold over 38.19 meters, including a high-grade core of 25.05 g/t gold over 5.10 meters and 17.71 g/t gold over 9.00 meters. A new research report by analyst Simona Gambarini of Capital Economics suggests official sector buying can take much of the credit for establishing something of a floor for gold this year. Central banks have upped their share of overall gold demand from around 2 percent in 2010 to as much as 14 percent last year. Gambarini expects this trend to strengthen, thereby pushing up the gold price. Capital Economics has a year-end gold forecast of $1,400 per ounce. The $6 billion Resolution Copper Project in Arizona was discovered almost two decades ago and is slated to become North America’s largest copper mine. However, don’t expect production to start anytime soon due to the length of time it takes to get permits. Co-owners Rio Tinto and BHP Billiton waited 10 years to get federal approval in December to gain access to the land. It will likely take another five years to get permits from various federal, state and local agencies. The tortuous bureaucratic process to approve new mining projects in the U.S. is among the slowest in the world. Metals Focus took a look at the 10 major gold producers as a peer group to analyze performance and concluded that while costs have improved, the effective “shareholder margin” was very slim. As such, it is hardly surprising that companies have cut or even suspended shareholder dividends. Iron & steel equities outperformed this week amid steadily improving iron ore prices. The Bloomberg World Iron & Steel benchmark gained 1.1 percent over the prior five days. Given the recent rebound in iron ore prices, dry bulk shipping stocks gained for a second consecutive week. The Bloomberg Dry Ship Index increased by 3 percent for the week. Chemical stocks led a majority of the natural resource equities during the week on solid margins and an improving economic backdrop. The S&P 500 Chemicals Index gained 0.7 percent in the period. Offshore drilling stocks continue to be highly correlated to crude oil prices. This is because of their higher cost projects as well as financial leverage. The S&P Oil & Gas Drilling Index declined 3.7 percent over the past five days. Concerns over a rate hike by the Federal Reserve, along with the threat of rising interest rates, continue to weigh on bond proxies such as oil & gas infrastructure MLPs. The Alerian MLP Infrastructure Index dropped 1.5 percent in the week. Gold stocks underperformed this week in response to a stronger U.S. dollar and higher U.S. Treasury yields. The NYSE Arca Gold Miners Index fell 1.6 percent this week. Next week’s Department of Energy (DOE) crude oil report could show further declines in inventory levels given very strong demand for refined products such as gasoline. Oil refinery utilizations are at the second highest level in nine years. The Federal Reserve’s FOMC interest rate decision on Wednesday has the potential to positively impact commodities and related equities if expectations for a rate hike decrease later this year. Next week’s housing starts and building permits data could show continued improvements, supporting further gains in lumber prices. The U.S. dollar rose late in the week in advance of next week’s interest rate decision from the Fed. If the dollar continues to strengthen above near-term resistance levels, it could point to further dollar strength and commodity weakness. According to weekly DOE crude oil production data, U.S. production rose for a third consecutive week, which weighed on both WTI and Brent prices. If this trend continues, oil prices may fall significantly in the back half of the year, as inventories fail to decline fast enough from a lower rig count. Copper prices remained relatively flat this week despite weak data from China’s Fixed Asset Investment report. However, if the current trend continues copper prices may weaken over the summer before experiencing seasonal strength later in the year. Chinese equities outperformed on the back of speculation that the government will continue to foster economic growth through monetary easing. Furthermore, new yuan loans increased to 900.8 billion in May, while the M2 money supply growth rate increased to 10.8 percent. The Shanghai Stock Exchange Composite Index rose 2.85 percent this week. The Russian ruble bounced back from its sharp downside move last week as the central bank ceased purchasing dollars in order to stem the currency’s rapid appreciation. The ruble rose 2.78 percent against the dollar this week. The U.S. dollar retreated for the second straight week, adding further support to the technical notion that the currency is rolling over. The DXY Index fell 1.38 percent this week. Turkish equities along with the lira declined this week after the ruling AKP Party failed to secure the necessary amount of seats to retain power. The new uncertainty surrounding the inability of the various parties to form a coalition helps to explain the underperformance. The Borsa Istanbul 100 Index fell 1.72 percent this week and the Turkish lira fell 1.52 percent. Hungarian equities retreated this week on the back of little material information to explain the move. The Budapest Stock Exchange Index fell 2.01 percent this week. Greek equities were considerably volatile this week. The market reacted negatively on the decision to “kick the can down the road” in terms of the country’s debt repayment timeline. On a positive note, the rhetoric regarding the negotiations appears to becoming more positive on both sides. The Athens Stock Exchange fell 1.48 percent this week. Consumer prices in Hungary grew at the fastest rate this year, on a year-over-year basis, highlighting the effect of the central bank’s significant string of rate cuts. Inflationary pressures are certainly a welcome sign in the Hungarian economy. Polish consumer price index (CPI) data will be released next week. As investors remain uncertain on the necessity of further easing, the CPI number will be an important one to monitor. Analysts are expecting the month-over-month growth rate in consumer prices to contract by 0.7 percent, an improvement from the prior month’s contraction of 1.1 percent. Tenacious deflationary pressure along with anemic domestic demand in China, as revealed in the May economic data, should raise expectations from investors of further government policy easing (monetary, fiscal or administrative). This backdrop could benefit interest- rate sensitive and attractively-valued sectors the most such as banks and property developers. This would reinforce the ongoing visible recovery of property sales thanks to lower financing costs and rising wealth effects from the momentous equity bull market. Clearly the outcome of the Turkish elections creates a severe amount of uncertainty surrounding the country’s political future. If a coalition government is not formed then a snap election will be called, which could further intensify the uncertainty. Furthermore, the country’s macro situation remains considerably gloomy, with year-over-year GDP growth falling to a timid 2.3 percent. Despite the positive change in the rhetoric surrounding the debt negotiations, there still remains considerable risk that Greece could default and be removed from the eurozone. The Indonesian rupiah remains susceptible to further weakness against a tightening scare in the U.S. Similarly, the macro thesis of owning Indonesian stocks is being challenged as President Jokowi’s 30-percent tax revenue growth assumption appears increasingly illusive in a slowing economy, therefor diminishing the likelihood of realizing a fresh infrastructure investment cycle promised earlier. It may not be a stretch to argue that, in U.S. dollar terms, the bear market in Indonesian equities has resumed.